Air quality testing shows increased ozone levels in the Denver Metro/North Front Range area and the regulatory response may be painful for manufacturers. The Colorado Department of Public Health and Environment is currently developing rules to “bump up” the area to a “moderate nonattainment” status. Formal rulemaking is set to begin next week, but The Colorado Chamber is working with members in the utility, energy, and manufacturing sectors to generate more input regarding how certain aspects of the pending proposals could impact Colorado operators and business climate. Specifically, we’re asking manufacturers who would be impacted by tighter environmental controls on air emissions to contact us before rulemaking goes forward. Under federal law, state regulators have to tighten restrictions on a wide range of industries and potentially on transportation. We’re asking regulators to work with The Colorado Chamber and affected industries to work out a plan that achieves the environmental goal of decreasing ozone emissions in the least burdensome and least costly way possible. If you feel that this rulemaking could impact you, please contact us so we can include you in our efforts. Manufacturers recognize that a pregnant worker may have certain physical constraints on what she’s able to do, and that accommodating her at this time is generally good business. But there were many concerns about the way HB 1438 was introduced to mandate pregnancy/childbirth accommodations. The Colorado Chamber spent months working with the sponsors to make the bill fair to workers and reasonable for manufacturers. The success of that effort changed our position from opposed to neutral. Your HR department needs to know what the new law requires, and will need to have an interacting dialogue with the employee to agree on what meets her needs and yours. There are specific accommodations in the law that are by definition “reasonable.” This law goes into effect August 10, 2016. Find a summary here. For several years, proponents have advanced the idea of providing workers access to their personnel records. Sounds simple, but it’s not. When the employee-of-the-month asks to see her file, no problem. When the worker who asks is someone your loss management team is investigating – yeah, that’s a problem. After three years of fighting this legislation, The Colorado Chamber negotiated an agreement with the proponents of HB 1432 that allowed us to take a neutral stance. HR department: the bill allows workers access to their records once a year, in the presence of an HR employee. Most significantly, HR needs to know which records are exempt from review. (That includes those involving an active investigation!) This law will go into effect January 1, 2017. Find details here. The Colorado Chamber has worked for four years to clarify the rules on unemployment compensation and independent contractors. That electrician who’s been in your plant every day for a month? Contractor or employee? Confusing rules made the answer unclear, leading to audits and fines. Finally, the CO Department of Labor and Employment (CDLE) convened a task force and The Colorado Chamber actively worked with business advocates and regulators on common sense reforms which were then incorporated in SB 179. CDLE will clarify the rules and assign a full time employee to provide guidance to businesses. The bill also requires CDLE to conduct an internal process for improving audit consistency. The bill passed unanimously in the General Assembly. Paid Sick Leave Mandate – Ugh! Once again, The Colorado Chamber opposed an attempt to layer state sick leave mandates on top of federal requirements. SB 114 would have required all employers to provide an hour of paid sick leave for every 30 hours worked and allowed workers to carry forward accrued leave. If that doesn’t make you queasy enough, the bill would have specified how you have to track that time, and when workers can use it. The Colorado Chamber lobbied & testified against the bill which was defeated. You Expect to Be Paid HOW Much? So you need to hire a mechanical engineer and you got a dozen great resumes. You’d like to know which applicants you can afford before you invest time in interviews, but HB 116 would have prohibited you from asking for salary histories. Not only that, the bill created a new type of discrimination claim under the CO Anti-Discrimination Act, which includes costly legal consequences for employers. The Colorado Chamber lobbied & testified against the bill which died in committee in late March. If some lawmakers had their way, not only would you be unable to check salary history, you’d be forbidden from asking potential employees if they have a criminal background before allowing them to enter your recruiting process. The Colorado Chamber objected strongly pointing out that in a five-year study, 77% of felons were re-arrested. Besides the risk the bill posed to manufacturing workplace safety and asset security, there’s legal liability too. If you get sued for negligent hiring, you have a 75% chance of losing that lawsuit, with settlements averaging $1 million. 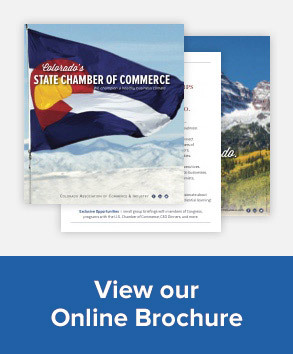 The Colorado Chamber protected your right to choose your policy by successfully lobbying & defeating this bill. Proponents of HB 1403 argued that too few employers offer workers a retirement savings plan and proposed HB 1403 which would have created a state-run plan and forced private companies to enroll. The proposal was badly flawed. It gave employers no choice in the plan they would offer their workers, and no choice of the vendor who would manage payroll deductions. The bill also mandated workers to participate in the plan. Audit costs and potential fines also posed a financial liability to businesses. The Colorado Chamber lobbied & testified against the bill and the sponsors withdrew the bill. Introduced late in the legislative session, HB 1435 would have imposed a fee on businesses that have 250+ workers if those workers make less than $12 an hour and qualify for public assistance. Sponsors made no bones about the fact this was a way to fund the state’s portion of Medicaid costs. Even though they admitted there were problems with the bill, it passed the House on the second-to-last day of the session. But with The Colorado Chamber’s opposition, it died in Senate committee the same day. For the extensive list of bills that the State Chamber has worked on throughout the legislative session, please refer to the Legislative Session Summary.